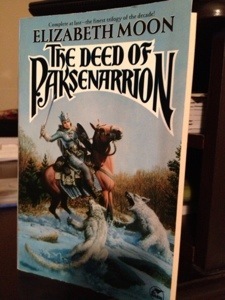 I am up to Chapter Seven of my The Deed of Paksenarrion reread. I was unable to read as quickly as I hoped, mostly due to a typically busy weekend. The next few weeks should be calmer. After reading these seven chapters, I was suffering some serious eyestrain. The omnibus edition that I had (my second, purchased and read a few years ago) squeezes every square millimeter it can out of each page, so the font is maybe 9 point. Guys, these eyes ain’t young anymore. Presbyopia is probably the worst thing about middle age. Wrinkles? Aches and pains? No problem. Old eyes that don’t focus on small fonts anymore? Suckage. When I first read this book, way back in the misty past when the omnibus first became available, I didn’t even notice the font size. Not anymore. Therefore, I checked out Amazon to see if Deed was available for Kindle. Lots of older books aren’t. Happily, it was–the entire omnibus was 8.99. I had 22 dollars left on a gift card so it was a no-brainer. This is my third copy of this book. So anyway, if you’ve read the book, I have a few questions and observations. What is your opinion of Moon’s writing strengths with this, her first novel? I think her strength was definitely point of view. In the first pages of the first chapter, we are behind the eyes of Paks’s father, Dorthan. Then, when Paks takes up a sword to defy him, we get a glimpse of her stubborn spirit. In the next instant, she runs out the door and from that moment, we are with her. Later, when Paks first puts on her recruit tunic, she is acutely aware of her bare legs in front of the entire platoon. And even later, when she must strip in front of the entire company, you can feel her humiliation. As for her weaknesses, for me, it was scene transitions. I had trouble with this throughout the series, especially when she is switching from Paks’s point of view, which does not happen very often. The beginning of Chapter 3, when Paks goes from being a top recruit to being locked up in the dungeon, is bewildering. It is probably meant to be that way, but I ended up paging back through the book to see if I missed anything. This is a pattern that kept up throughout the entire series. What is your opinion of the secondary characters? Secondary characters are very much in second place in this series. The book is about Paks, and even though she makes friends readily, none of them feel fully fleshed out. Vic is my favorite, the son of minstrels, yet he cannot sing. However, he is never more than a tertiary character. The true secondary characters — Stammel, Saben, Barra and later, Canna and the Duke — get more depth, but still, I wished I could have known these characters better–especially the one who later becomes a villain. And what did you think of Paks? To be honest, the first time I read this story, I struggled through the first book, mostly because of the sheer quantity of the battles. But it was my reader connection to Paks that kept me going. In the second book, all struggles disappeared because it then truly becomes The Adventures of Paks. Nowadays, when I reread these books, I don’t have the same trouble that I had the first time around, mostly because I know what is coming, and because it is just so fun to relive the story again. I’ll try not to spoil the story for you! I really don’t think it is possible, tho. Most of the story wouldn’t make much sense unless you read what comes before, anyway. Alas, I will not be able to actually participate in the discussion, as I have not read any of the books. SO many people have implored me to read this series (I am a lover of fantasy) but though I’ve tried to get into it several times, I’m afraid that thus far, it has overwhelmed me with so much *stuff* each time I tried to begin it. Some of this, I am very sure, has to do with the way my brain works (I cannot read much when I’m writing on my own books, because it causes a traffic jam in the pathways of my brain) and then often when I do take a break from writing, I usually gorge on books, reading them all in one go. The Deed is not something you can gorge on in that manner, it’s something you have to chew your way through. Which isn’t a bad thing, but it is a thing that narrows my chances of reading. I will be very keen on hearing what others have to say though! I would have to say that the first book is definitely one you have to chew your way through. For the second book, after the first chapter or so, [SMALL SPOILER] Paks is on her own, and they definitely become “gorging” books at that point. I was quite impatient for her to go solo! Awesome! Fortunately, I have been reading slowly. You have inspired me to put up another post soon! I had to buy the Kindle version because the omnibus was so hard for me to read. It is definitely a great introduction to Paks. I’m interested in hearing what you think of Chapter 3. Great post. I agree with everything you said. I hope you are enjoying the story enough to go on, because this is a book you have to put some investment into before it rewards you. Regarding your last point–yes, there is very little internal monologuing. This improves as the story goes on; you do get deeper and deeper in Paks’s head. The opening chapters reminded me very much of basic training. At first, you catch very few names, and you don’t have time to focus much on their faces. You know the sergeant, your bunkmates, those who march beside you. Then, as time goes on, they become clearer and clearer. It is kind of like starting a class as well; you only notice those round you at first, plus the teacher. Then, after a few weeks, you notice the cute guy across the classroom. The way Moon introduced the characters reminded me of that.